We're less than 24 hours away from the (rumored) launch of the X-T2, and all signs point to the rumors being right. There are Fuji hardware events scheduled for tomorrow in various cities around the world, and final product shots are being leaked onto the internet just as they were hours before the X-Pro2 was officially launched. 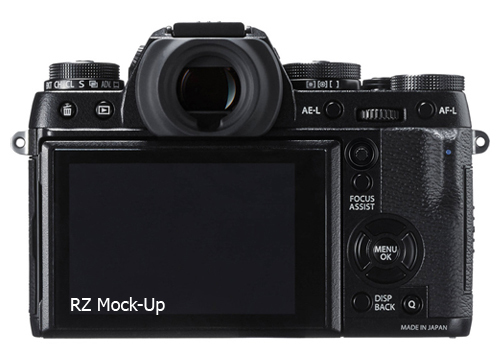 This morning I remembered that I created a mock-up showing what I thought the X-T2 would potentially look like based on the (at the time) new X-Pro2...so how close was I? Update: The X-T2 has been unveiled and I've added my reactions and thoughts to the bottom of this post! First thing's first: what do we know about the X-T2 so far? The obvious answer is that the majority (if not all) of the technical improvements from the X-Pro2 will be included in the X-T1 successor. New sensor, new ISO capabilities, new film simulation, etc (I talked briefly about the X-Pro2 options that should make it over to the X-T2 in this blog post). For a complete rundown of the rumored X-T2 specs, I'd suggest reading the updates from Fujirumors. A few more pictures can also be found at this Petapixel link. But how about that mock-up? Let's take a look and go over some of the hardware features. On the left, we have the latest leaked X-T2 image from digicame-info.com, and on the right we have my mock-up, which is just an X-T1 image that I modified with a layout that I thought we might see on the next X-T camera. The focus point joystick is there, of course, but I think Fuji went the obviously smarter way and didn't put the Q Menu button in the awkward position that I placed it. Instead, the Q Menu remains and the Focus Assist button is gone. Presumably the joystick itself will be clickable to allow you to zoom into the shot to check focus if necessary. Having the joystick closer to the directional pad will also probably make it easier to reach. A few other things that jump out at me: the ISO and shutter speed selectors seem to be larger and more robust. It'll be interesting to see if it prevents the accidental shooting mode / metering mode changes that sometimes occur in the heat of the moment. Speaking of metering modes, it looks like we have one more to choose from on the X-T2. I also noticed the eye-cup is different on the X-T2. It actually looks like the X-T2 has the extended long eye-cup attached to it (my X-T1 with the long eye-cup looks exactly like that X-T2 image). That'd be a welcome change. A "grippier", more exaggerated grip at the front would also be welcome, as I also have the extended grip attached to my X-T1 and find it far more comfortable to hold without fear of it slipping away. The hinge on the tilt screen looks a bit different, perhaps this one articulates in a different way. As far as the size of the camera goes, the X-T2 is actually supposed to come in slightly larger (and presumably heavier) than the X-T1. That might be to fit the updated articulating screen or perhaps to provide sufficient heat dissipation for new video modes. DID SOMEONE SAY VIDEO MODES? 4K? NEW CODEC? Excited: I'd love to see that great new sensor and the high ISO capabilities provide some beautiful footage through those amazing Fuji lenses. I have to be honest, the idea of filming in ACROS with some grain applied is appealing! Not excited: Even if they provide 4K capabilities, I really hope they've tweaked the software to cut back on moire, and I'm hoping we don't have to separately purchase the new battery pack to be able to power said 4K capabilities. Plus, we need to be able to record at a nice high bit rate to really take advantage of that resolution. Hopefully this is a video overhaul and not just a repackaged version of the previous video software on Fuji cameras. There's a rumored X-Pro2 firmware update to coincide with the X-T2 announcement, so perhaps they're bringing some of these video capabilities to the X-Pro2 as well. Fuji hasn't really been known for their video capabilities in the past, but with the right amount of attention from Fuji, that could change. All in all, I'm ready for this update. The hardware looks good, and I've already seen the great files that come from the X-Pro2 so we know we're looking at a quality upgrade. I'm excited to have the updated articulating screen, the extra resolution and some faster focusing speeds. I usually wait to see some of the bugs ironed out on new hardware releases (X-Pro2 reset, anyone?) but I have to be honest: my credit card is already halfway out of my wallet. 4K Video: Yes, it's a fact and YES, the bit rate has been bumped up. I'm also quite impressed with the F-Log ability, but I'm still unclear as to whether or not you can record in Log without HDMI out. I'm pretty sure you're able to record 4K Log to the SD card, but some previews that I've read have only talked about FLog when discussing the 4:2:2 HDMI out. Leave a comment below if you can answer that one for me. Price: $1599 USD (body only) is not bad! I would have liked $1399 but with the X-T1 still going for $1299, that proved unlikely. At some point a rumored $1899 price tag was called out, and I'm glad it didn't reach that high, because it would have priced it outside of my personal comfort level at that point. $1599 seems reasonable for this type of upgrade, especially since I can recoup some of that with an X-T1 sale. Availability: B&H is calling for this to be available mid-August which is fantastic. With a trip to NYC planned for early September, I'd love to take the X-T2 along for the ride. Autofocus Modes: It sounds like Fuji has really pushed the edge of speed and functionality with the AF mode selections and even allowing us to customize our own AF behaviors. That kind of customization is an unprecedented level of AF control in the Fuji camera world. I'm really eager to see how it performs in hand using final firmware. Tilting Screen: While I think it's a nice innovation to offer an LCD orientation geared toward vertical (portrait) shooting positions, I don't see myself using this one very much. I was hoping for something more like the articulating screens that can be found in some Panasonic and Olympus m43 cameras - if only to swivel the whole screen around to close it and protect it when not in use. New batteries: They say the new NP-W126S batteries are streamlined to handle 4K recording better than their NP-W126 counterparts by avoiding overheating. I'm hoping they also squeeze out a few more shots per charge, so I'll be getting an extra one of these as well. Fuji has confirmed that the previous generation NP-W126 batteries will still work in the X-T2. Battery Grip: I like the idea, but it's not for me. I like that it can boost performance and recording time, but I'd probably only rent one if using it in the capacity that it calls for - sports shooting, perhaps concert shooting, long format video shoots, maybe even paid wildlife shoots. It's also a bit pricey at $329 USD. Overall, I'm happy with this upgrade. The X-T1 is a fantastic camera and Fuji have pushed it so far with firmware updates. Because of that loyalty to their cameras and to their customers, I have no problem buying into the X-T2 and watching Fuji continue to push new and innovative enhancements to their latest hardware. The pre-order is in!